At USAID we’re fortunate to work on an incredible mission. But it’s an impossible one to achieve on our own. That’s why we’re always looking for creative ways to engage new problem solvers and develop new partnerships. One of the best ways to engage the public is to open up our data. Set it free. Make it accessible. By opening up seemingly boring reams of spreadsheets to outside analysis, we have an opportunity to discover new trends, opportunities, and yes, inefficiencies. In March, Administrator Shah wrote about how effective aid is transparent and accountable aid. This June, we took this commitment one step further when USAID’s GeoCenter and Development Credit Authority (DCA) hosted the Agency’s first-ever crowdsourcing event to open and map loan guarantee data. Crowdsourcing is a distributed problem-solving process whereby tasks are outsourced to a network of people known as “the crowd.” Without the staff or resources to comb through 117,000 loan records on our own, we turned to the crowd for help in opening our data to the public. The idea that the public would be willing to volunteer their time to geocode data – that is, to pinpoint the location of USAID loan guarantee activities – raised some eyebrows. Yet what we anticipated would take an entire weekend sorting through 10,000 hard to identify data points, only took 16 hours thanks to an incredible outpouring of support from the online volunteer communities Standby Task Force and GIS Corps. Social media tools helped bring many more people to the virtual table. Ultimately, volunteers wanted to meet like-minded people, plug into USAID, and make a difference. And they did. DCA utilizes partial credit guarantees to encourage private financial institutions in developing countries to lend their own money for local development. The released data represents an anonymized 117,000 loans made by these institutions thanks to risk-sharing agreements with the U.S. Government. While this data was extremely valuable, we couldn’t map it until all of the location records were standardized. With the release of DCA’s data and associated map, entrepreneurs in developing countries can discover existing lending facilities in the sectors in which they work, USAID Missions can analyze guaranteed loans across borders for a more complete picture of development impact, and donors can overlay their guarantee data onto USAID’s to increase future opportunities for collaboration. These are just a few of the immediate impacts of opening up our data. This event also marked the first time that data.gov was used as a crowdsourcing platform. And thanks to partnerships with private companies like Socrata and Esri, we were able to customize the event at no additional cost to the Agency. By thinking outside of the box, we were able to put existing tools to use in new and innovative ways. 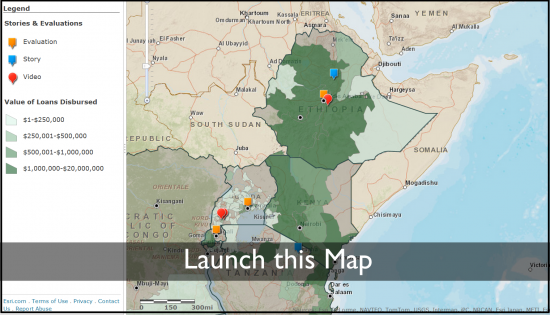 The complete dataset, associated map, and case study can all be accessed on USAID’s website. These materials were presented at the Woodrow Wilson Center for International Scholars on June 28th and available via livestream. We invite you to explore the data, draw your own conclusions and add your analysis. We’ll continue to explore unique ways to engage the public in our work. Development isn’t something that happens overnight. But with increased transparency, we can start working together to solve development challenges in a more efficient – and fun – way.